Excel VBA Application object is the one of the most frequently used object while automating any task with VBA. We refer different Excel applications and perform various operations on Excel Workbooks. We have different Properties, Methods to deal with Excel Application Object. Here you can find a brief explanation about each on most useful Properties and Methods while automating any task. Our objective of building this Excel VBA Explorer is to provide suitable examples on most frequently used methods and properties of Application object. So that you can quickly find the solution, syntax whenever you required it. Application methods helps us to perform different actions with Excel Workbooks. For example, we can Run a Application and Stop a Application ,etc. Calculate: To Calculate all Open Workbook. CalculateFull: To forces full caluculation in all the open Workbook. FindFile: To display open dialog box to open a file. Goto: To select any range. Run: To run a procedure or function. Wait: To stop running macro. 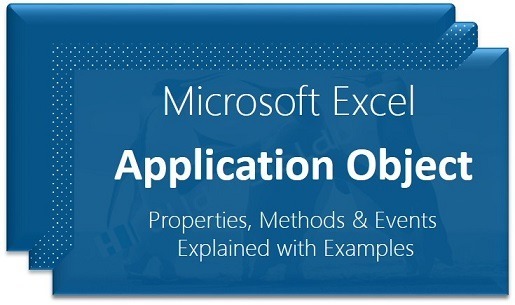 Properties of Application object will helps us to deal with various properties of Excel Applications. For example, we can change the Application Caption, sets the user name,sets the window state of the Application, etc. Calculation: To represent calculation mode. Caption: To represent name of the title bar. DisplayAlerts: To represent display alerts. DisplayFormulaBar:To hide or show the formula bar. DisplayScrollBars:To stop or display scrollbar. DisplayStatusBar:To display status on the status bar. Path: To get the complete path of the application. ScreenUpdating: To turn On/Off screen updating. StatusBar:To sets the text on the status bar. UserName: To sets the name of the user. WindowState:To sets the state of the application window. Dear Mr.P N Rao ! Your website Analysistab is a wonderful site where one can learn a lot about excel vba. Thanks for the nice feedback Venkat! – PNRao! I managed to hide the status bar in Excel 2013 using the code below. I can open a new workbook without the status bar. But when I open a saved workbook, it opens the saved workbook and a new workbook. How can I open just the saved workbook alone without opening a new workbook? I want to learn Excel VBA but I can not understand that how can I learn Excel VBA? The best way is to start with simple macros with Macro Recorder and Try to understand the Excel Object Model. You can follow our tutorials where we have provided numerous examples on Excel VBA. However, we are going to start our online classes in couple of weeks. You can joint if you are interested. How can I pick the data in the cell to a vba variable then display in a text box arranged according to my preference.